Now that the regular season is over, here’s a final batch of the scatter graphics, which compare the attacking and defensive performances of every team in a division. Each of the four graphics is explained briefly below and at length here. 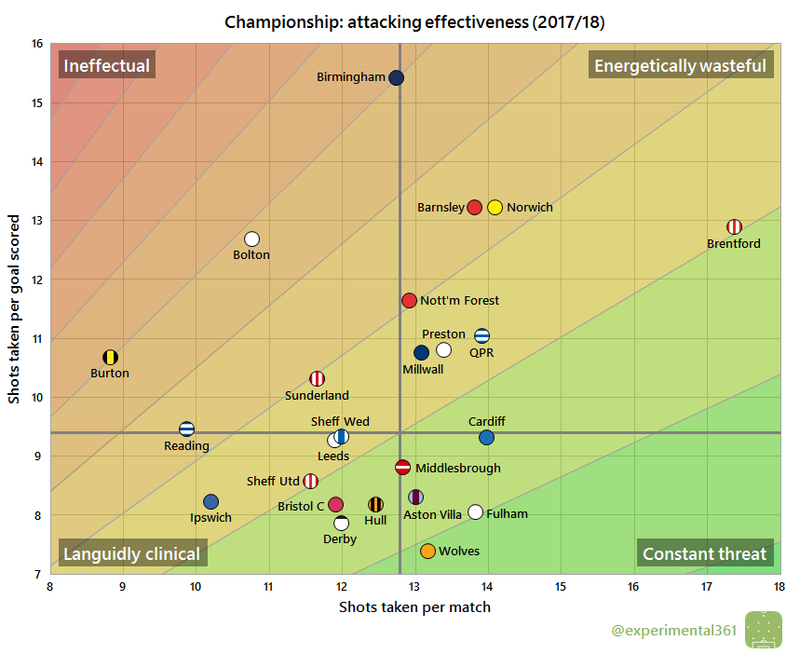 Brentford‘s energetic attack have stood out from the crowd with the sheer volume of shots they’ve taken this season, although as the next chart (and indeed the league table) shows, this isn’t a recipe for success by itself. Ipswich have allowed over a shot more per game than anyone else and carved out fewer opportunities than all but two other teams, so it’s understandable that the fans weren’t opposed to a change of manager. Brentford may have taken the most shots by far, but only three teams have been more wasteful in front of goal this season. 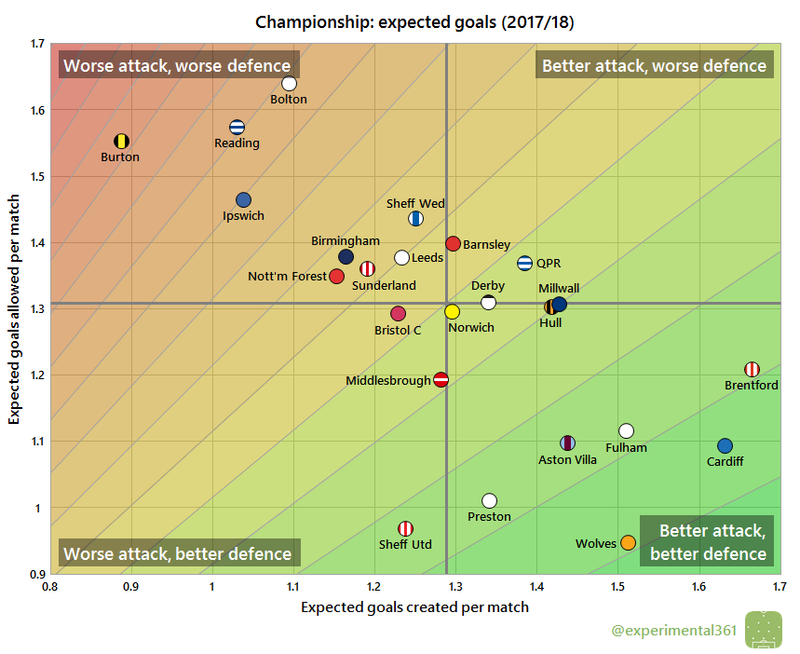 Birmingham take the cake however with over twice as many chances created for each goal scored as champions Wolves (the most clinical finishers). Barnsley and Norwich can also point to a profligate attack to explain their disappointing campaigns, with both creating a respectable number of chances but struggling to convert them. 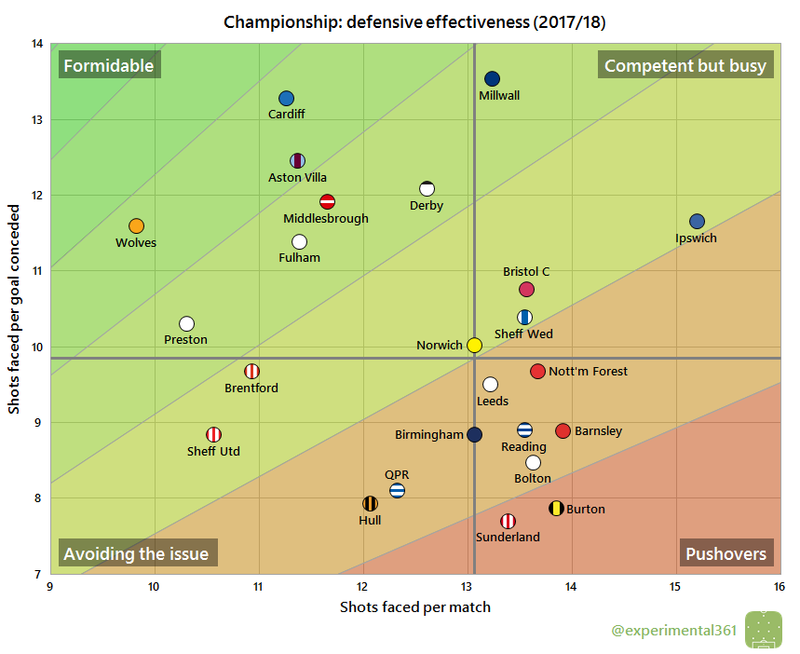 Millwall and Cardiff both excelled at keeping their opponents’ shots out of their goal this season, while the relegated duo of Sunderland and Burton operated the division’s most porous defences. 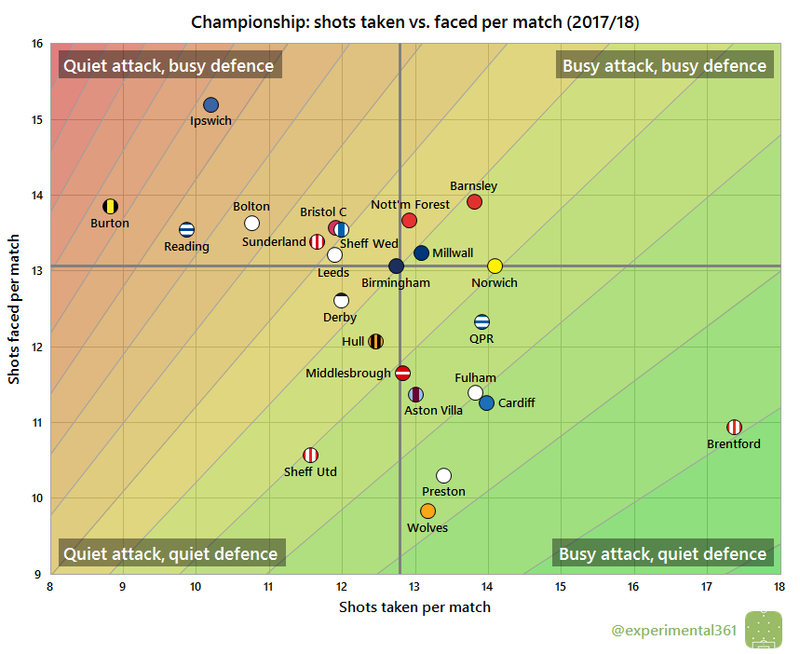 Ipswich deserve an honourable mention for soaking up a lot of shots – they allowed around three shots per game more than the likes of Hull and QPR but conceded fewer goals overall. When we adjust for shot quality the top two of Wolves and Cardiff look to have secured their promotion on merit. They head a cluster of seven clubs in the bottom right who look to have performed at a level above the rest of the division. Interestingly this cluster doesn’t include the play-off pair of Derby and Middlesbrough, both of whom have endured chaotic seasons. Burton‘s relegation doesn’t look all that surprising given their position here – they did well to take the relegation battle down to the final day – while Reading and Bolton will surely be looking to ring the changes over the summer to avoid a repeat of this season.